Whether you want to go out or stay in this Saturday night, you have great options to laugh, learn and marvel at everything that is wonderful about dogs! Dog behavior and training expert Cesar Millan brings his speaking tour, Cesar Millan Live, to Baltimore’s Lyric Theater Saturday night January 14 at 8:00 p.m.
Cesar is a best-selling author and the star of the popular televsion show “The Dog Whisperer” on the NatGeo WILD cable television station. He will speak about his dog training techniques and take questions from the audience. 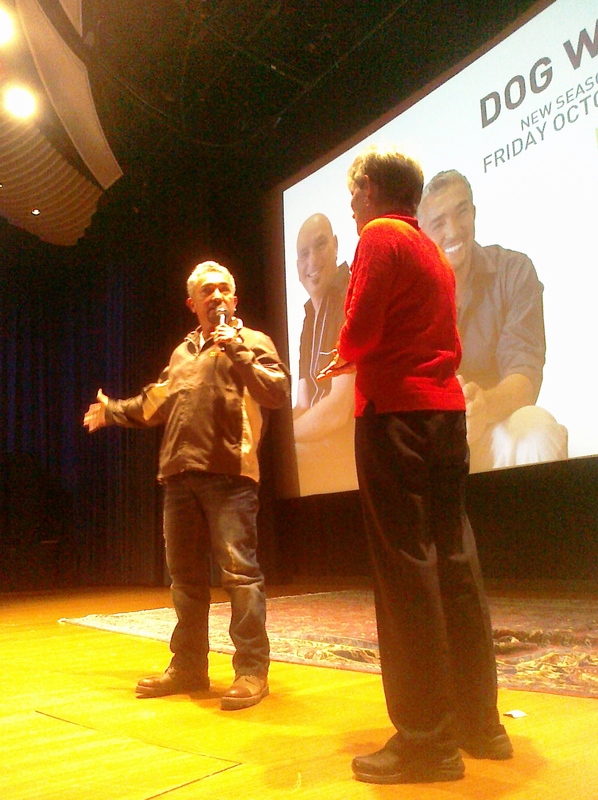 I got to see Cesar speak in 2010 at the National Geographic headquarters, and it was a great show. He is funny, insightful, self-deprecating and truly amazing in his ability to help dogs–as well as helping the owners, who are more often than not causing the dog’s problem behavior. Read my post about Cesar’s show on Oct. 4, 2010. Tickets are available from Ticketmaster and range from $42 to $55, plus a service charge. He only has six shows scheduled in the U.S. before he heads to Costa Rica and New Zealand, and the next closest to the D.C. area is in Norfolk, Va., on April 7, so don’t miss this opportunity! Also on Saturday, at 5:00 p.m. EST, couch potatoes can watch ordinary dogs perform extraordinary feats like flying disc tricks, dock diving and agility courses during the Purina Incredible Dog Challenge competition.